The Employee record allows you to manage Employee details such as Employee Name, Contact Information, Employee Photo, and Scheduling Availability. This record is created automatically after the POS Integration has been completed. Each Employee record represents an Employee that has been entered in to your POS Systems. As Employees may work at several of your Locations, there is a possibility that some of the Employee records are duplicate entries. These records will need to be merged in order to properly use the Scheduling and Manager Log modules. Click here for more information on Merging Employee Records. Please refer to the Employee App Access article for more information on granting your Employees access to the R365 Mobile App. As not all Employee information is importable from all POS systems, it is recommended that Employee information be updated and maintained within Restaurant365. 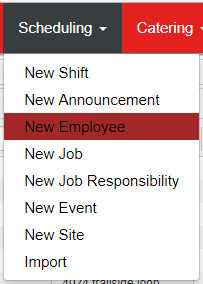 To setup an Employee manually, select 'New Employee' on the 'Scheduling' menu in the top ribbon. This will open a blank Employee record where the Employee information can be entered and saved. Similar to all other lists in R365, locate the record you want to view, then double click the row to open the record in a new tab.